Based in Minneapolis, Minn., Alyssa Northrop is a Registered Dietitian who has been writing about nutrition and health since 2004. Her work has been published in the scientific journal Explore. She holds a Master of Public Health in human nutrition from the University of Michigan. There are many reasons to love yogurt: It is rich in probiotic bacteria; it is a good source of important nutrients like calcium, vitamin D, protein, potassium and B vitamins; and it may be more easily digested by individuals with lactose intolerance than other dairy products. If you are looking for a low-fat, high-protein snack, you will find many delicious options in the yogurt section of your dairy aisle. As far as low-fat, high-protein yogurts go, Greek yogurt is the star. It is made by straining the whey from traditional yogurt, resulting in a denser, creamier yogurt that has twice as much protein -- 23 grams per 8-ounce cup -- as regular yogurt. Beware that some “Greek” style yogurts are thickened with additives such as pectin, cornstarch, gelatin or carob bean gum instead of being strained. While these imposters have the creaminess of Greek yogurt, they do not offer the same protein. Check the nutrition label to be sure you have the real deal and choose a low-fat or nonfat option. With about 10 grams of protein per 8-ounce cup, low-fat yogurt provides less than half the protein of Greek yogurt. And what low-fat yogurt lacks in fat -- it provides only 2 to 3 grams -- it often makes up for in sugars. One cup of fruit-flavored low-fat yogurt can provide 43 grams of sugar, more than in a 12-ounce bottle of soda. Choose plain low-fat yogurt, which provides only 15 grams of sugar, and add your own fresh fruit for a healthy, delicious snack. 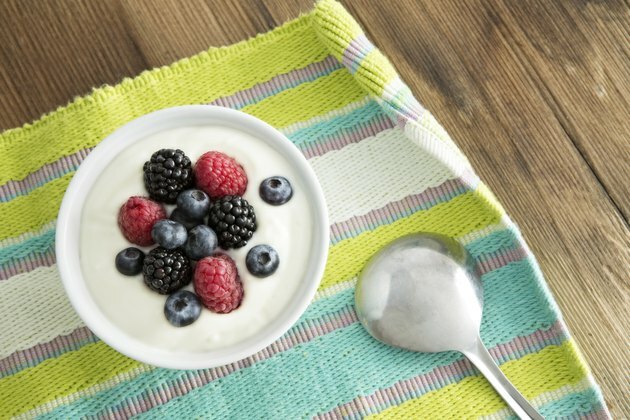 Fat-free yogurt provides the same amount of protein as low-fat, but with 0 grams of fat. Again, watch out for even more sugar in the fat-free variety. On the plus side, both fat-free and low-fat yogurt are better sources of calcium than Greek yogurt. Since the calcium in yogurt resides mostly in the whey, much of it is removed in the process of making Greek yogurt. However, some Greek yogurts are enriched with calcium to make up for the difference. If the many choices of yogurt in the dairy section weren’t enough to make your head spin, you may also choose from a variety of yogurt alternatives, such as kefir, soy and coconut yogurt. Kefir is a cultured probiotic beverage, likened to drinkable yogurt, that provides similar amounts of protein and fat as low-fat yogurt with a bit less sugar. Kefir is particularly high in beneficial bacteria. Soy and coconut yogurt provide less protein than both kefir and dairy-based yogurts. Choose soy and coconut yogurts that include live active cultures for their probiotic benefits. The Times Picayune: Is Your Favorite Brand of Greek Yogurt the Real Deal or a Greek Yogurt Fakeout? What Yogurt Has the Lowest Carbs and Sugars? Is Greek Yogurt Really More Nutritious Than Regular Yogurt?